Tie ends and done...Rocker Chic! Great idea, thanks for sharing it! Do you need special pliers or will it work with every other pair of pliers as well? There are several ways of setting grommets but the pliers will save your sanity (and fingers). There are several methods of setting grommets but the pliers will save your sanity (and your fingers!). Thanks gals! This one is one of my fave tees. Hope you get around to trying it! Hopefully get my shop up and running soon! thanks Giselle! This is fantastic! It looks terrific on you! 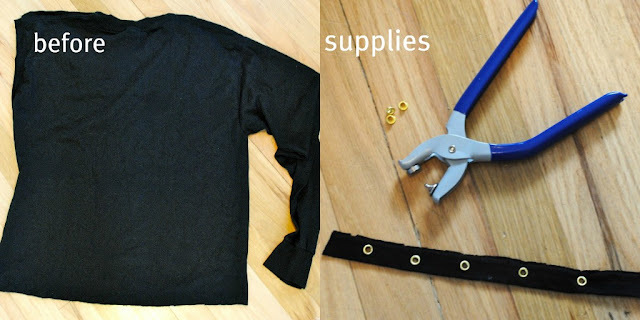 I am interested in using this technique to lace up the sides of a t-shirt, but I'd rather skip the grommet-by-hand part and have a ready made strip as you mentioned you have seen in fabric stores, but I cannot find it! Joann's doesn't seem to carry it, in store or online, and I have just spent an hour searching online for "grommet tape" and "eyelet tape/strip" and similar things, to no avail, other than one choice on Etsy. Any ideas? Your beautiful work (and beautiful self!) are an inspiration! Thank you for sharing your works of art! I do see it at joanns where I am. Have you tried the trim sections? I would go to the section where they sell the grommet pliers and they usually have some there sold in yards or in a case. Hope you find it...ask the workers for help too, they should have some. I just bought it from JoAnn Fabrics today, it's in the spool section that sell by the yard. Did you finish off the sleeve edges or the bottom at all? If not, how does it do after washing? And is the bottom cut anything special or just straight (looks as though the back is cut longer that the front). Just curious before I destroy a shirt I really want to try this on! I love it!! That's so neat! I'm def going to try this! I love this! I'm def going to try this! Could also do this along the sides and wear a cami underneath. Could also do this along the sides and wear a cami under. Would a smaller tee look as good? I have a new concert tee I'm wanting to do this to, but I'm unsure of how it would look because it's my size (small). I'm thinking I might leave the sleeves on as well. I love this and its not often I find stuff I like, your very talented! Thank you for sharing. How did you make the trim? did you just use spare fabric? Love your style and vision. talented girl you are! admire how you take such an easy concept/method and create something so genuine and punk. admire you! How much would this shirt cost in real life? Love all the tips Thank you for sharing them! I hope you will continue to have similar posts to share with everyone thanks for this article you have to be shared at this time. It's an excellent diy tutorial. If you like the cast, you should see The Mule youjizz. I don't think it's a hard R but I know it's not for everyone.